Santa, Jack Frost and 36 Hours of Gluttony! In the first week of December we ventured to Northumberland for our much-anticipated Winter Wonderland experience in the beautiful gardens of Alnwick Castle. B and myself have a humongous soft spot for this area, therefore expectations were soaring high. Over the course of the day of festive fun we met The Elf Himself, a jolly elf with a rather inflated ego who kept the kids amused with songs and a rather interesting game of pinning the ears on the elf. The wonderful Jack Frost was inspired and magical. 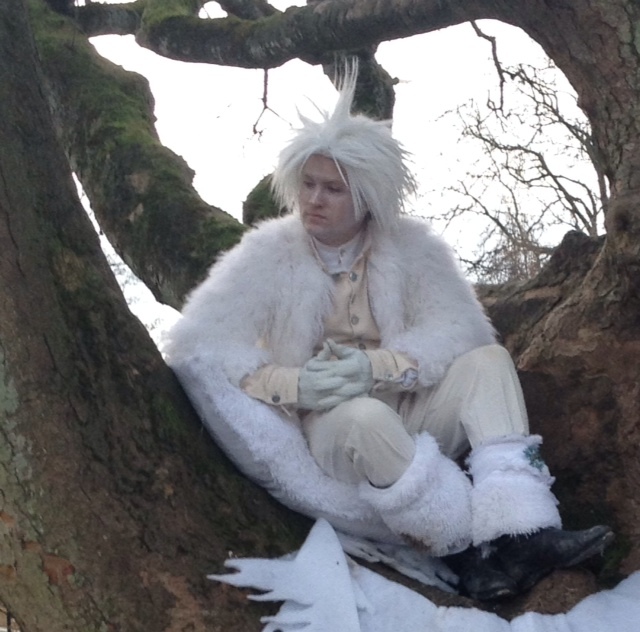 He was to be found sat in a tree wearing a fantastical Tim Burtonesque costume. He delighted his audience with tales of a naughty elf called Piper and made the youngsters (and dads) giggle with talk of an elf called Poo. Mrs Claus disturbed me slightly by going off message with her initial chat of Christmas shopping – Santa delivers all gifts on his Sleigh you silly old woman. Well I guess she is around 200 years old so some level of senility is acceptable. She redeemed herself with a bit of audience participation and handing out ‘magic reindeer dust’ to the children. 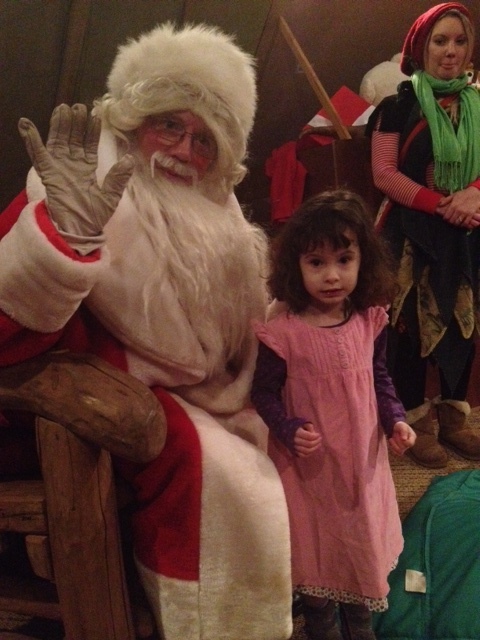 Finally the man himself – Santa! The children hunkered down in the incredibly atmospheric grotto in front of the dozing Mr Claus and dutifully sang jingle bells in order to wake the Auld yin up. It was sold to us as an intimate experience with around ten children at a time but in fact there were about 30 kids making the mood more chaotic than intimate. It was all going so well until Santa forgot to call out our poppet’s name from his big book. Disaster was narrowly averted but a stern complaint to the management about Santa’s conduct was filed. Oh this is a food blog isn’t it? I better get round to the absolute gluttony that took place over our 36 hours in Northumberland. I guess it all started with lunch at the Treehouse. The stunningly unusual Alnwick Treehouse is located on the edge of the grounds of Alnwick Castle and Gardens and it as magical inside as it appears on the outside. Alnwick Castle is well-known for its connections with the famous wizard Harry Potter, and this restaurant always has me humming ‘Hedwigs Theme’ as soon as I step inside. 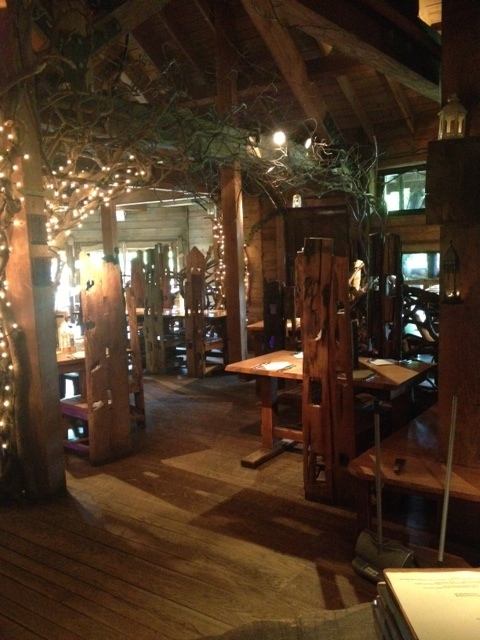 It is a labyrinth of rustic furniture, twinkling fairy lights and a big old fire pit. You expect to be served wine in a goblet rather than a glass. 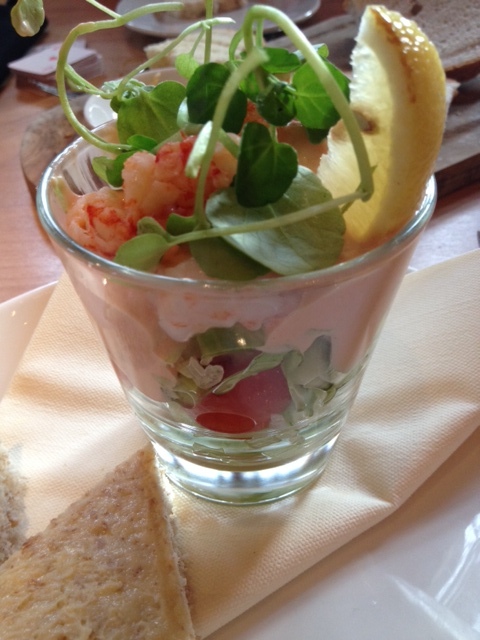 Both B and I chose the prawn cocktail to start. the retro style cocktail pretty much did what it said on the tin but the inclusion of lovely meaty crayfish made it a little bit more special. Next up was pork belly for me and turkey with trimmings for B. I love pork belly and this pork belly was nice if not outstanding. The crackling was great, as crackling always is but to be honest I was a teeny tiny bit disappointed in the star of my main course. This was served with fondant potato and a silky cider gravy. The potato in question was beautifully browned and crisp on the outside and fluffy on the interior. I am to cook fondant potato for the first time in a few weeks for a dinner party so I am a little bit in awe of good fondant potatoes at the moment. No time for dessert but we were to make up for that later! After our fabulous day soaking up Christmas at Alnwick Gardens we headed to the Hogs Head Inn for dinner and a well-earned sleep. The Hog’s Head. located on the edge of Alnwick is a shiny new building which only started trading in July of this year. On first impression I thought that The Hog’s Head looked akin to a Premier Inn set up. However as soon as you walk through the door you are hit by such a lovely warm atmosphere that any negative preconceptions drift away. We had dinner in The Hog’s Head’s lovely open plan bar/restaurant area. 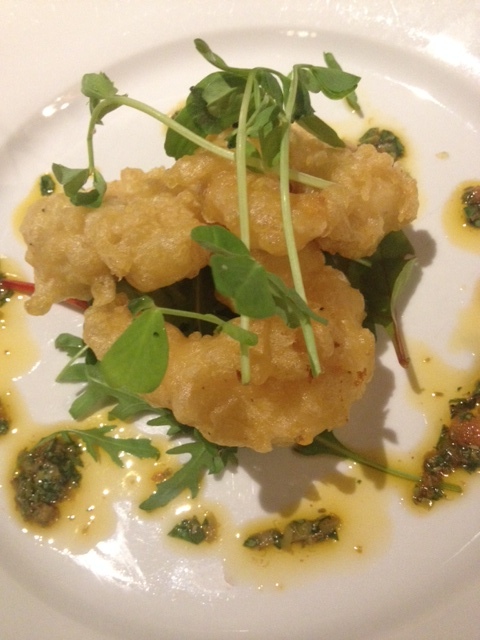 I kicked off with tempura prawns which were enormous and pretty good, although the star of the starters show was B’s Deep Fried Potato skins with both a BBQ sauce and a garlic mayonnaise. 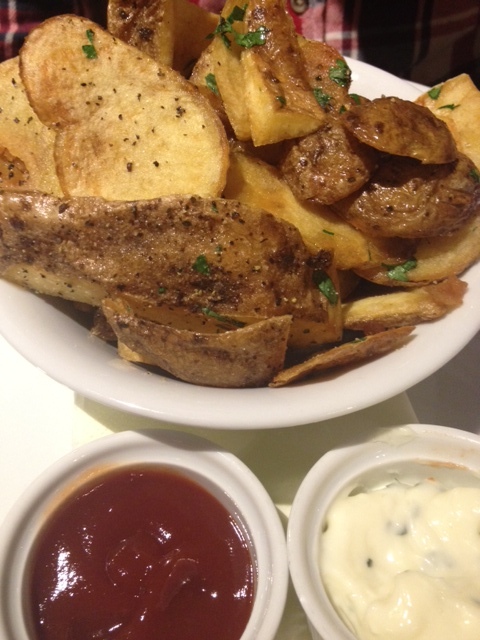 Unlike most potato wedges these did not drag half the potato along with them. They were deliciously thin and crispy and best of all plentiful. As soon as I could shove my prawns down the hatch I was shovelling up these lovelies with lashings of BBQ sauce. My main course was a sizzling Teryaki Skillet with Chicken served with rice. Unlike most of the main courses this seemed to be a portion for a normal person. Bs chicken burger extravaganza was clearly meant for a giant!! The Teryaki chicken was lovely though could have been a little more flavoursome. Main schmain – heaven on a plate was about to descend. For some ‘now regrettable’ reason we decided to share a dessert. 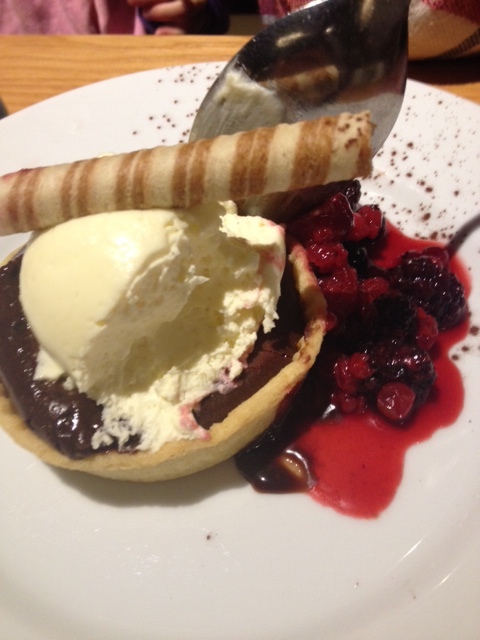 The delight in question was a Warm Salted Chocolate and Caramel Tart with Winter Berries capped with a White Chocolate Ice Cream. How many of you are drooling now eh! This dessert was bloody marvellous. The only potential fly in the ointment was the ice cream, as I am not a fan of ice cream appearing anywhere outside of a cone BUT this ice cream was dubious (in a fantastic way). It was more like a big lovely ball of white chocolate flavoured clotted cream. My arteries were screaming for mercy – I ignored them and dug in, eager not to be short-changed in this sharing frenzy. The pastry was beautiful and light, the filling was sweet and oozingly perfect and the ‘ice cream’ was strangely wonderful. By the way the rooms in the Hog’s Head were fabulous. Our family room was the size of a small country – warm, beautifully furnished and had everything we needed – great place to stay for a short break. The next day we waddled to the car following a hearty Northumberland breakfast and headed to Lindisfarne for a bracing walk to the castle (well worth a visit). We did think that we could never eat again, but strangely after a bit of exercise my tummy was telling me otherwise – it might even have been grumbling! So a late lunch was in order at the Lindisfarne Inn in Beal where we received a lovely Northumbrian welcome complete with crayons to keep young GT happy. This was the pinnacle of my weekend of gluttony and it was possibly the best meal of the whole weekend. I ordered from the Light Bites menu, although the term Light Bites makes me giggle – it was enormous. 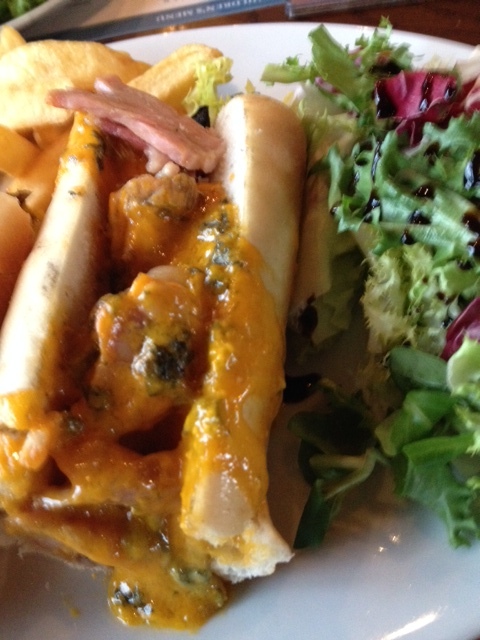 I opted for the Bacon, Mushroom & Blacksticks Blue Cheese Baguette which was absolutely marvellous. The fantastically full flavoured cheese was superbly tasty and made great friends of salty bacon and lovely soft mushrooms. Well done on that combo Mr Chef! By the way, Blacksticks Cheese is produced by Butlers Farmhouse Cheeses in Lancashire and is described thus “Soft and squishy with a wonderfully smooth creamy taste and a delicate blue tang and instantly recognised by its striking amber hue” . It was indeed a wonderful, wonderful blue cheese which I plan to source sometime soon for my own cheese-board. 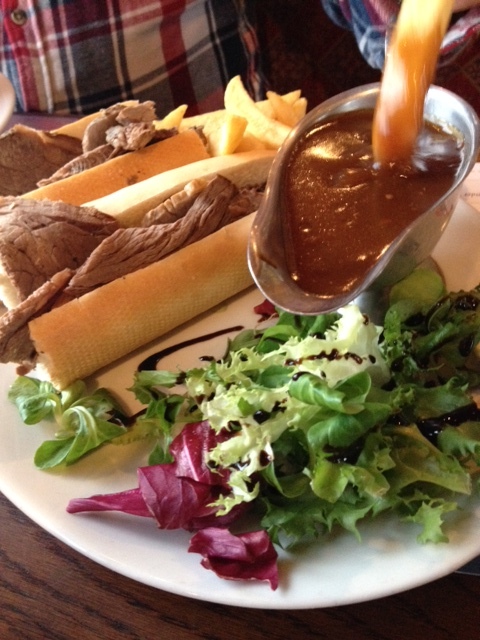 B opted for a baguette filled with roast beef and gravy on the side. It looked impressive and the noises coming from him were entirely positive. To be honest I was lost in Blacksticks heaven so barely registered his existence for at least 20 minutes. Next up dessert …. oh no we didn’t … oh yes we did! Who could resist Warm Hot Chocolate Fudge Cake with cream on the side? Certainly not me. Well it was divine, as one would expect from a great big slab of chocolate heaven. B chose apple crumble which was rather odd in that the apple part was perfect but the topping was powdery rather than toasty and crunchy. He seemed happy after dousing it with a liberal amounts of custard however. My favourite thing about a crumble is the toasty crunchiness so I was very glad I opted for my particular sweet obscenity. So now we are home and I have been eating mainly fruit and soup (sort of) in a rather vain attempt to fit in to … well anything for the Christmas party season. It’s not going well and I find myself pondering – was it worth it? Categories: Uncategorized | Tags: Alnwick, Alnwick Castle, Alnwick Gardens, Hogs Head Inn, Jack Frost, Northumberland | Permalink. The Celeriac is a rather unfortunate looking vegetable, and to make matters worse it is also known in some areas as Knob Celery – which may be rather funny but is not the most flattering moniker. This blog post is here to give a big shout out to celeriac – the unsung hero of the root world. So why is this knarly vegetable so good. 1. It tastes damn fine. I would describe the taste sensation as celery with a rich earthiness thrown in for good measure. 2. It is healthy. Much less starchy than many of its rooty relatives, making it the perfect choice for those watching their figure. 3. It is versatile. I use it much in the same way as I would a potato in soups and stews but I also mash it up with my tatties to make them more interesting and healthy. A dollop of low fat creme fraiche and a wee bit of nutmeg would make the mash even better if that is possible! 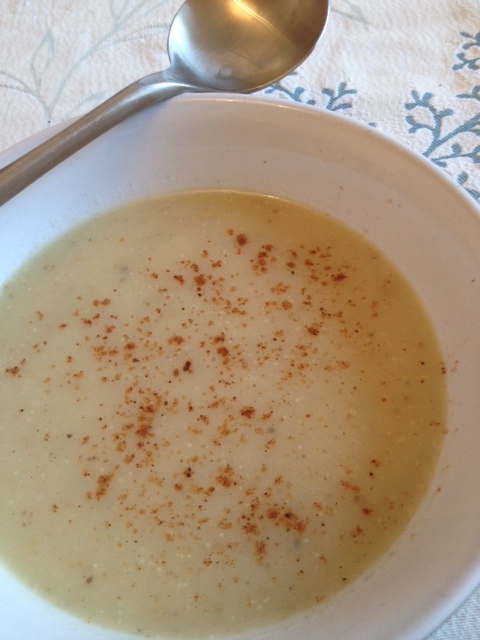 Last week I made a lovely heart warming soup which gave me a great big festive hug. 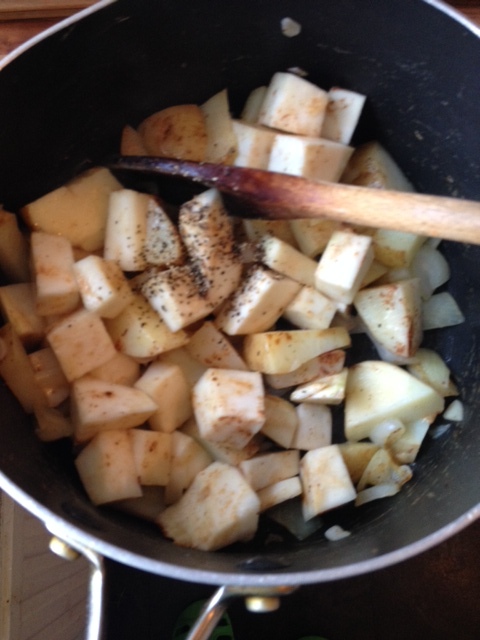 Tatties, celeriac, onion and nutmeg – simples! Add stock – I use 1 and a half stock cubes and enough water to cover the veg plus an extra inch. Erm not the most scientific I know – I would estimate that this is around 500mls. A big old knarly festive hug to you all! Categories: Uncategorized | Tags: celeriac, vegetable stock | Permalink. I have been an awfully good girl this year (mostly) and have my eye on a number of fantabulous foodie finds. Perhaps you could check if there are any of these items kicking about in your workshop. There are Thai curries fragrant with lemongrass and lime leaves, fiery Sri Lankan seafood curry, rich sweet Caribbean curries flavoured with herbs and allspice, as well as the familiar Indian classics. 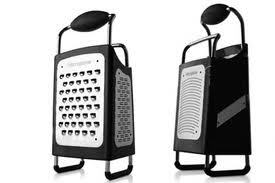 My current grater is from Ikea and it does the job, or rather it did the job. It is now kaput and a new grating device is needed. Microplane is the Ferrari of graters I am told and this 4 sided box grater features 3 stainless steel microplane blades together with a slicing blade all in a contemporary ergonomic design with a non slip hand grip and end pieces for added comfort and stability. Perfect – though Neave’s days of helping mummy grate could be out of the window as I believe this grater is sharp enough to remove small fingers – ouch! Some might think that Emma Bridgewater is a bit passe now but I am not one of them. My friend Vickie has a collection of differently patterned mugs from this iconic designer and when she brings them out I always feel a little bit of mug envy. 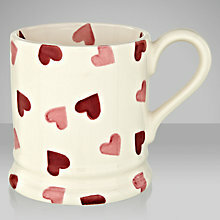 I do rather like the idea of a mix of the pink heart, blue heart and spotty mugs. They are pricey for what they are but Santa has big pockets. I was seduced by Yotam Ottolenghi’s honey chat on his recent yomp around Corsica. I had no idea that this little French island was so well-known for its honey. 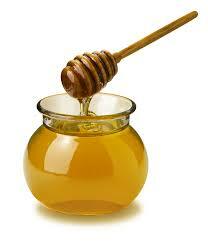 There are many different varieties of Corsican honey, all influenced by the famous Corsican “maquis”. The maquis refers to the particular herbs and trees that bees will forage. The Corsican honey that tops my list is the Summer Maquis Honey – light coloured, fruity and flowery, born out of thyme and brooms and anthyllis. I like Jamie Oliver, but for me the undisputed star of both Jamie’s 30 Minute Meals and Jamie’s 15 Minute Meals was his super duper food processor. I actually believe I could cook like Mr Oliver if I was in possession of this piece of kit. 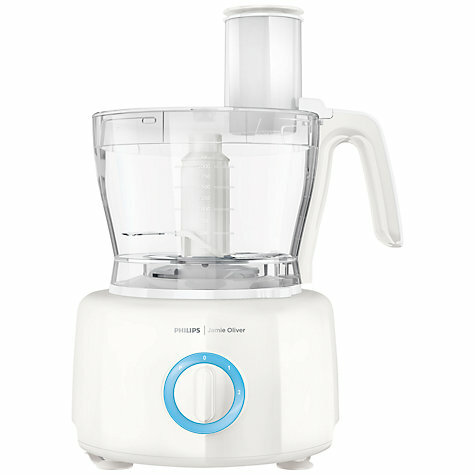 The Jamie Oliver food processor by Philips promises to enable you to prepare anything from salads to ice cream – the ultimate helping hand in the kitchen. Includes gizmos to chop, cut, mash, knead, whip and whisk, slice and shred. I suspect if you asked it nicely it may also do the dishes. I am a cook without a food processor (dropped mine some time ago and it broke good and proper) which is this day and age Santa is a travesty. 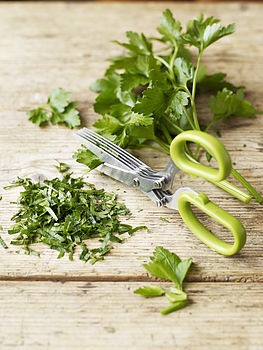 I don’t particularly find it a challenge to chop herbs but I do feel that I bruise them a bit when I hack at them with a knife, plus I always have big leafy bits which seem to escape the knife prompting B to say “what’s this green stuff in my stew”. I like anything that makes life easy and this little gizmo looks like it will give me uniformed chippity choppity herbs in no time. I am a drinker of fruit teas – mainly peppermint. It all started a few years ago when I was a martyr to my stomach! Doctors drew a blank but one lovely medical bod got me onto drinking gallons of peppermint tea and now I am hooked. B is also a fan of the peppermint tea regimen. 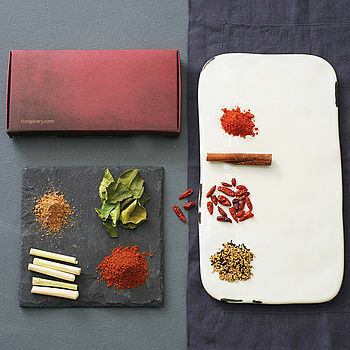 We normally buy teabags about I often think it would be lovely to experiment with loose leaf teas. 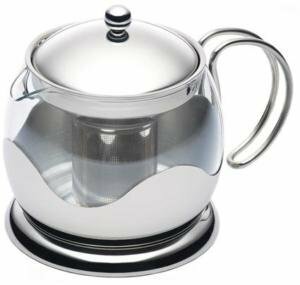 This beautifully stylish glass teapot fits the bill perfectly. A good friend and fellow food blogger over at www.eatwithoutwheat.blogspot.com was lucky enough to experience the Hugh treatment a couple of years ago and I must admit I did suffer a severe bout of foodie envy. I love Hugh and his books are without doubt the most thumbed in the kitchen. 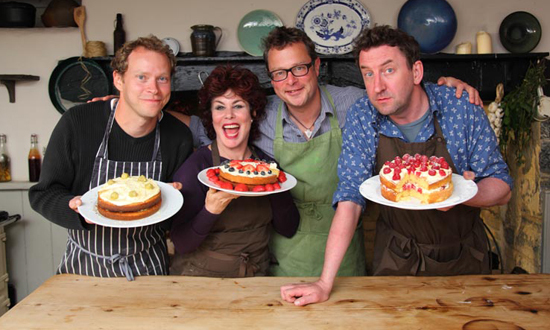 They aim to give you a real taste of River Cottage and at the end of the day your efforts are rewarded with a fantastic three-course River Cottage feast using the ingredients you have gathered and harvested. 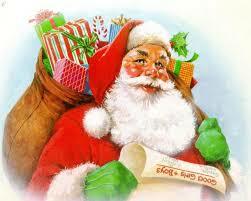 One day I shall do this Santa – with or without you! I admit that this would probably be one of those pieces of kit that would end up gathering dust at the back of the cupboard along with the soda stream but what the hell, it looks like fun. I love the idea of being a Swiss Miss, hosting a dinner party of melty cheese and meats. It is also an excuse to forage in Mellis the cheese shop for speciality raclette cheese. 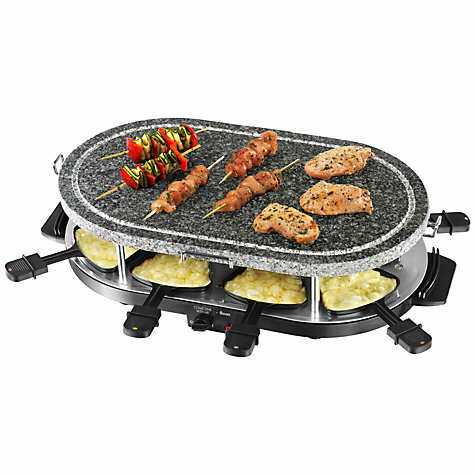 This stone raclette from John Lewis includes 8 raclette pans and 8 wooden spatulas which means that everyone can be a part of the cooking action! There is a removable stone grill which lets you cook food on top of this unit as well as in the pans provided. 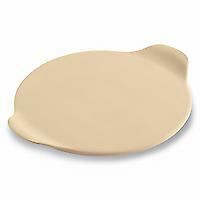 I have been to rather a lot of Pampered Chef parties over the years and have met many folk who swear by the Stone products. I can’t actually get my head around just why they are so good but the near evangelistic fervour from those who cook with them is enough to convince me that they are just a little bit special. There is also the fact that you scrape them rather than wash them which seems like a bit of a bonus. Categories: Uncategorized | Tags: Emma Bridgewater, food processor, Jamie Oliver, River Cottage, Santa | Permalink. It was St Andrews day on Saturday, and proving that there is more to traditional Scottish food than Haggis, I agreed to join in with the Scottish Government’s Foodie Campaign by enjoying a’ St Andrews Night In’ with a home-made fish dish. It all seemed rather appropriate that I should be cooking fish for St Andrews Day. You see St Andrew was an “agile and hardy fisherman” and coincidently my dad was also a hardy fisherman, although agile is pushing it a bit. Dad is a bit late to have been a disciple of Jesus like St Andrew but if he had been around he would have been first in the queue. Plus he lives in St Andrews. Only one hitch to all this marvellous synergy – I have never cooked white fish in my puff. I have only just got over my irrational fear of eating white fish but cooking it is another matter entirely … it’s the bones you see. Despite being the daughter of a fisherman I have always had issues. I love the taste but have a ludicrous fear of finding a fish bone. What do I think a wee fish bone will do to me? The mind boggles. However as mentioned in a previous blog I feel that the next step to my recovery is to actually cook the stuff, so this was all rather timely indeed. Luckily Seafood Scotland’s Young Chef of the Year – Adam Newth – had come up with some simple fish recipes for Scotland.org which seemed perfect for a newbie fish cook like me. I opted for the Smoked Haddock bake. Proudly trotting home from my local fish monger with my undyed fillets of smoked haddock I set to work. Was it really that easy to make? It really was a stupidly simple recipe. 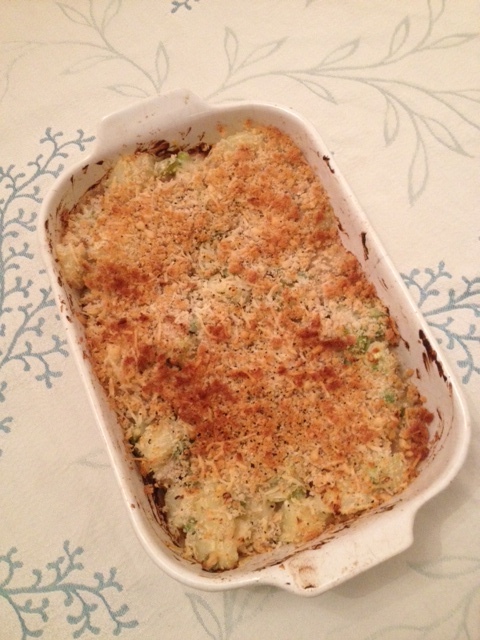 It included low-fat creme fraiche, broad beans, peas, spring onions and potatoes, all topped off with mix of parmesan and breadcrumbs. It was so easy that I may well get mini grumbling tummy to help me put it together next time (oh yes there will be a next time). 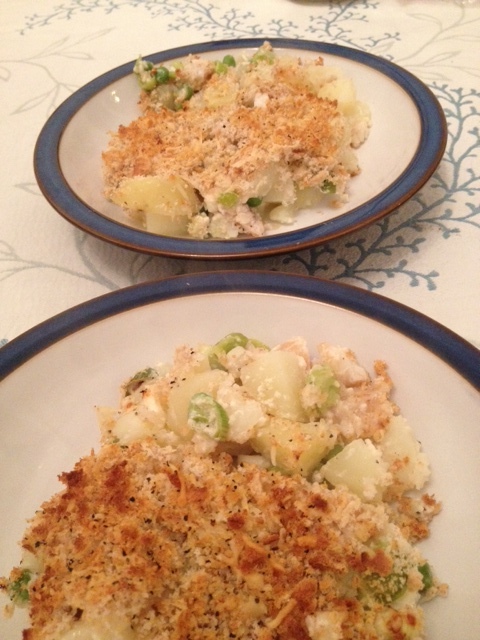 It is the perfect dish to get kids involved with – simple and healthy. The proof is in the eating? There were clean plates all round which speaks volumes. 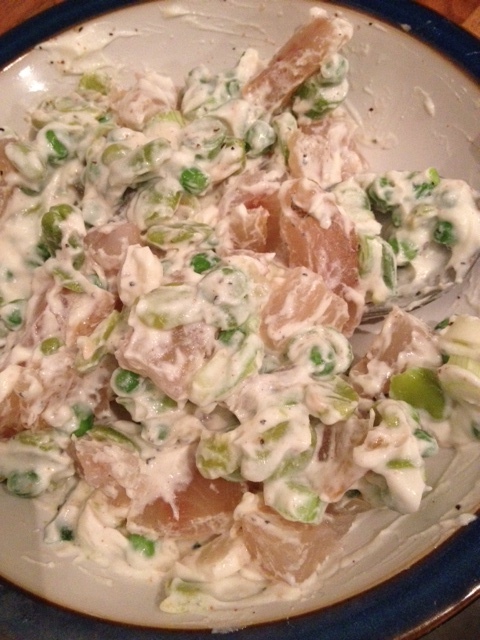 The low-fat creme fraiche was an easy route to a silky sauce and I loved the addition of the broad beans. The potato made it a really filling one pot dish and I particularly appreciated the contrast of the crunchy parmesan topping. I doubled up on parmesan …… because I could and that worked well for our cheese loving family. There is a lot of scope for experimentation with this sort of dish – using different types of fish , adding dill and perhaps throwing some diced carrot to the main mix. St Andrews Day may be over for another year but we should still be including sustainable fish in our diet. Apart from tasting great it is extraordinarily healthy. So go on have a go – Adam’s recipes are still available for you to try St Andrews Day Menu. Categories: Uncategorized | Tags: Adam Newth, St Andrew, St Andrews, St Andrews Day, St Andrews Night, white fish | Permalink.